Palm trees rule. At least in the countryside, where a group of resourceful students have recognized that the leafy trees are valuable sources of food and money. Having discovered that there are riches to be reaped from palm trees, students from the National Institute of Technology of Cambodia have established a business turning the sap drawn from palm buds into vinegar. While gaining a few extra pennies themselves, the students help to employ country-dwellers who pick the sap from neighboring fields for sale. Local products are good for local people. Palm vinegar serves to replace the traditionally imported versions made from various acids. According to Pok Leakreasey, head of the Palm Vinegar Enterprise in Cambodia, imported vinegar is made from a variety of acids that can be harmful to one's health. If the vinegar's level of acidity is not properly measured, it may be particularly grueling on one's stomach, he said. Unlike these unchecked versions of vinegar, the palm variety has a lower level of acidity and is less injurious to the body. In 1999 Pok Leakreasey and his team of 35 researchers began looking for an alternative to the highly acidic vinegar damaging their countrymen's stomachs. 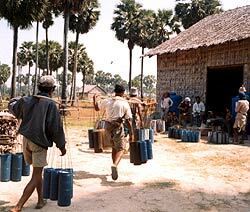 Funded by their own resources, the team succeeded in producing palm vinegar just two years later. Achieving their goal was particularly rewarding to the team, Pok Leakreasey said, since it not only offered the country a new food product but also employed the rural poor. "This product is really important to the people because food along the streets of Cambodia is not considered hygienic," he said. "This would be good for cyclo and moto dop drivers in Phnom Penh who usually eat their food from street vendors." Nam Nivana, a drug quality specialist at a Phnom Penh lab, said the palm vinegar is more pure than more acidic versions. To produce palm vinegar, Pok Leakreasey and his team pour palm sap into a large tank where it is stored for about six months. Once the sap has soured, it is considered vinegar. Palm sap often is sold for approximately 100 riel per liter, but palm vinegar reaches prices as high as 1000 riel per liter. Large bottles generally sell for 1300 riel. 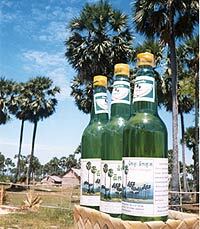 On average, Cambodians consume about five million liters of vinegar every year, according to Pok Leakreasey. 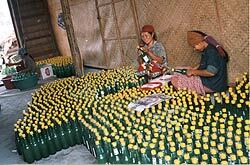 Attempting to meet the growing demand for palm vinegar, his enterprise produces 50,000 liters of the product every year. Although limited funding has prevented the team from producing as much vinegar as they would like to, it aims to raise production to 70,000 liters next year. The Palm Vinegar Enterprise is located in the Dounman village of the Sam Roungleur commune in the Kandal Stung district of Kandal province. Although currently small in size, the business is big on ideas. Managing one of the country's few Khmer-run enterprises, Pok Leakreasey and his team are on a fast track to success.